Rivers and canoes comprise the great Canadian union. 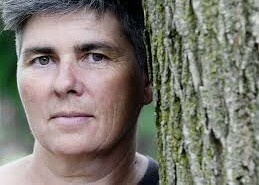 This bond of geography and history, place and identity, metaphor and symbol, myth and story is affirmed with the publication of two recent books: The River by Helen Humphreys and Canoe Country by Roy MacGregor. Rivers run through Humphreys like life-sustaining blood through arteries. In 2007 she published The Frozen Thames, a respected collection of 40 vignettes that pays tribute the eponymous river drawn on events that occurred each time the river froze between 1142 and 1895. With The River, published by ECW Press, the celebrated Canadian writer paddles — imaginatively speaking — closer to home. For more than a decade Humphreys has owned a small waterside property on the headwaters of the Napanee River, in eastern Ontario not far from her home in Kingston. Meanwhile, she has quietly and insistently become one of Canada’s most accomplished writers. With four books of poetry, seven novels and her second book of creative non-fiction, she walks the fine line between critical acclaim and popular appeal with grace and élan. With the eye of a visual artist, the lyrical gifts of a poet, the curiosity of a Victorian natural historian and the close and meticulous attention to detail of a scientist, Humphreys celebrates the small body of water that is closest to her heart, body and imagination — some readers might go so far as to say soul. As a result, it’s both a personal and an intimate portrait. The River is equal parts natural history, biology, botany, geology, history, anthropology, geography, archeology, meteorology and historical fiction inspired by actual people. The handsome literary miscellany incorporates fictional and non-fictional narrative, poetry, archival photographs and illustrations, paintings, drawings, maps, lists, found objects and featured photographs by Tama Baldwin. This is nature filtered through the creative lens of culture, where ecology and philosophy intersect with art through poetic description and reflective meditation. The River appeals sensuously to all the senses, evoking the sights, sounds, smells and even tastes of the river and its immediate environs as day and night, subsurface and surface, aquatic and terrestrial, flora and fauna meet at the convergence of water, earth and sky. In her introduction Humpherys asks: ‘How can we know anyone or anything?’ We come to know someone or something through language. By reading The River we come to know not only her particular river, but all rivers generally. The book is not long. It can be read quickly; but it’s most fulfilling when read slowly and savoured, like letters from a long-absent loved one. For, as romantically anachronistic as it is, The River is a love letter written to the river that is home — what fly anglers cherish as home waters. I love rivers. 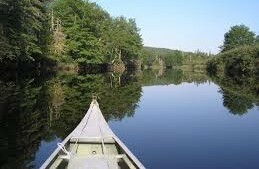 I love canoeing rivers. I love standing in rivers and casting a split-cane bamboo fly rod at finicky trout and voracious smallmouth bass. For many years I crossed a river on my way to school, and later, to work. I dream of rivers. I long to live on a river. Rivers are the source of life. When the time comes, my ashes will float down a river toward the sea of eternity. Some of my favourite works of art depict rivers, paintings by Tom Thomson, the Group Seven, Winslow Homer, Russell Chatham and Ken Danby and prints by Canadian engravers Gerard Brender à Brandis, George Walker and Wesley Bates. A limited edition print of Alex Colville’s Seven Crows, featuring a meandering river though a meadow, hangs over our living room fireplace. I love reading about rivers. I have a shelf-full of favourite books devoted to rivers, including: Henry David Thoreau’s The Maine Woods and A Week on the Concord & Merrimack Rivers, Norman Maclean’s A River Runs Through It, John Grave’s Goodbye to a River, Annie Dillard’s Pilgrim at Tinker Creek, Roderick Haig-Brown’s A River Never Sleeps, Ted Leeson’s The Habit of Rivers, James Babb’s River Music, Harry Middleton’s Rivers of Memory, Jerry Kustich’s At the River’s Edge, David James Duncan’s The River Why and David Adams Richards’ Lines on the Water. Others I also love are too many to name. They say you can’t judge a book by its cover. But as weird as this declaration sounds, sometimes you can. The front jacket of McGregor’s Canoe Country, published by Random House, features an illustration of a painting by the late Ken Danby. 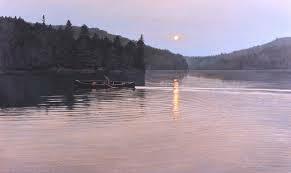 Algonquin – Homage to Tom Thomson shows a lone canoeist on a glass-smooth northern lake under a full moon. In his introduction, MacGregor describes the canoe as both ‘historical artifact’ and ‘unifying symbol’. Framing it within the context of ‘the national psyche,’ he identifies the canoe not only as ‘one of the great Canadian characters’ and ‘a significant national personality’ but ‘the greatest wonder of a wonderful country.’ That’s heady stuff, but few readers will argue after reading Canoe Country, the author’s 20th book. MacGregor is especially suited to write a celebration of the canoe. As a writer — newspaper columnist, sports writer, memoirist, biographer, fiction and non-fiction writer and children’s author — he has his creative fingers on the pulse of our national imagination like few others. Equal parts cultural history and passionate memoir, the book begins with a personal account of why canoeing is so significant to McGregor. He has close family ties with Algonquin Park, which pulsates at the heart of canoeing in Canada. It concludes with a harrowing, near-death canoeing experience first published in Canadians: A Portrait of a Country and Its People. In between, McGregor traces the evolution of the canoe in Canada, primarily from European contact to the present. Along the way we meet the prominent Canadians most intimately connected to the canoe (including former Prime Minister Pierre Elliott Trudeau, disgraced Archie Belaney, otherwise known as Grey Owl, and canoeing guru Bill Mason), the adventurers and explorers who relied on it to explore and chart the country (especially David Thompson), the craftsmen responsible for modifying its design, and the materials and the devoted enthusiasts who popularized its use. MacGregor travels further afield to give an account of the role of the canoe in the doomed military Nile expedition to save the celebrated English General Charles George “Chinese” Gordon in the 1884 Siege of Khartoum. The most moving narratives tell heartfelt stories of people MacGregor knows personally, such as paddle-mates Phil and Lorne ‘Riverhawk’ Chester or the late journalist Blair Fraser, who was killed while whitewater canoeing. MacGregor is a creative recycler, green to the bones. Readers familiar with some of his previous books including Canadians, Escape, A Life in the Bush, The Weekender and Northern Lights (his biographical memoir of Tom Thomson), will hear echoes in Canoe Country. But they will be as welcome as the lonesome cry of the loon at eventide on a northern lake. MacGregor is a compelling storyteller who, like Pierre Berton before him, transforms historical research into high drama, elevating ordinary people who do extraordinary things into folk heroes. Canoe Country joins a growing shelf of Canadian canoeing books including: The Canoe by Jim Poling, Sr; Fire in the Bones & Bark, Skin & Cedar by James Raffan; Canexus: The Canoe in Canadian Culture, edited by Raffan & Bert Horwood; Idleness, Water & a Canoe by Jamie Benidickson; Nastawgan: The Canadian North by Canoe & Snowshoe, edited by Bruce Hodgins & Margaret Hobbs; The Canoe in Canadian Cultures, edited by Hodgins, John Jennings & Doreen Small; not to mention such books by Kevin Callan as Weekend Wilderness Adventures and Dazed But Not Confused.